1. What is it about man that makes us uncomfortable with situations such as this? Why do we show partiality based on outward appearances? Why do we make assumptions and judge people by what we see? Read Luke 18:10-14. Does the story Jesus tells in this scripture provide an idea or clue as to the reason that we might not treat others the same? What is it? This story is almost the same as the story in James chapter two. The two stories are the similar and appropriate for comparison because both are stories where the judgment of one by another is seen as wrong when both have come to worship God in the same assembly. The clue is given by Jesus in verse 14. He tells us that the Pharisee exalted himself and was not humble, but was as a result of his self-exaltation, he will be humbled; and in contrast, the one who humbles himself will be exalted. 2. Do you wear your best available clothing for church services? Do you pay more attention to what you wear to church compared to other events? Why or why not? Verses 5 through 7:God honors the poor why don’t you, why honor the rich who don’t honor God? 2. James Chapter 2 the author reminds his readers who were typically poor, that the rich are exploiting them, dragging them to court, and slandering the noble name of Jesus Christ. Is James encouraging his poor brethren to disrespect the rich members of the assembly? Why or why not? James is encouraging them to follow the royal law found in Scripture and shown in verse 8 “Love your neighbor as yourself”. 1. How can you be guilty of the whole law when you only break one point of the law? Why it say in James Chapter 2 verse 10 that if you offend in one point or you break just one law you are guilty of the entire law? What is the point of James Chapter 2 verses 10 through 13? When you are guilty of one transgression of God’s law you are guilty to the same degree of all laws that God has given us. Sin is sin. Breaking any of God’s commandments always yields the same result - broken fellowship with God which is sin. The point James is telling us is that we cannot say we have fellowship with God and yet we do not have fellowship with other believers. This is grounded in the great commandment that we are to love our neighbors as ourselves. 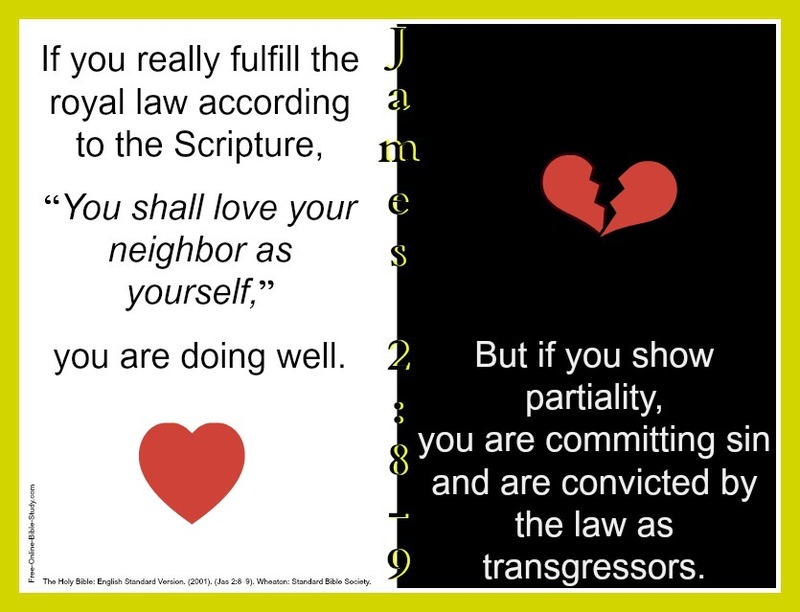 James contrasts the proper conduct of loving one’s neighbor as oneself in verse 8 with the improper conduct of partiality in verse 9. Where partiality occurs we are obviously guilty of disobedience to the Great Commandment to Love God and Love Our Neighbors as Ourselves. 2. Was there ever a time in your life where you were loved by someone that would demonstrate the idea of “love your neighbor as yourself”? 1. Does the second half of James Chapter 2 say that one is saved by works or good deeds and not by faith? What is the main point of the second half of James Chapter 2? No, James is saying that faith alone or by itself is not indicative that one is saved. Look at verse 19, James points out that even the demons have faith that God exists. The main point is that faith that God exists and a mental acknowledgement that God exists is simply not enough. We have to make Jesus Christ LORD in our lives. We have to be sold out to Him and when we do that our good works will follow. Look at the example that Jesus gave us of his servant leadership. 2. Considering the main point, if you were to choose the main verse or phrase of James Chapter 2 verses 14 through 26, what would it be? James Chapter 2, verse 24: James 2:24 Ye see then how that by works a man is justified, and not by faith only. That is NOT to say that works justifies anybody. But it is clear from verses 17, 20, 22, and 26 that faith always is followed by works as a testament to the authenticity of the faith. Please don't be quick to judge your brothers and sisters in Christ by what you see and regard as their "works". The best servants are often behind the scenes and are works are only known by God Almighty. They are humble and wish to remain anonymous because they know that all the glory belongs to God the Father. 1. What did Jesus Christ teach us about the concept of faith and works? Please cite a Scriptural example. While it is often proper to remain anonymous for your good works, Jesus tells us to let our lights shine before men. Why? So God will be glorified - That is always the objective of true faith - to let your light shine, to let your works be known - so that God will receive the glory. Jesus also taught us that we will be known by our fruits. Believers will bring good works and unbelievers will bring bad works. Jesus said the treasure of your heart will determine whether your works are good or evil. 33 Either make the tree good, and his fruit good; or else make the tree corrupt, and his fruit corrupt: for the tree is known by his fruit. 34 O generation of vipers, how can ye, being evil, speak good things? for out of the abundance of the heart the mouth speaketh. 35 A good man out of the good treasure of the heart bringeth forth good things: and an evil man out of the evil treasure bringeth forth evil things. 2. Besides Abraham and Rahab, who from Scripture best illustrates this concept of faith with works, i.e. works in the sense of good deeds? How or why did you choose this person’s life as your citation? But Jesus Christ was the man I think did the greatest works - works in the sense of good deeds. He always did his father’s will. He fed thousands of people, he healed many of demons, he healed the sick, but more than anything else He did the greatest deed ever done and that ever will be done. He died for all mankind that all who will call upon the Lord will be saved. He died for all yet he had no sin. He died for my sins and for your sins. This is the greatest deed - this is the greatest good work that has ever been done. No other good deed will ever come close to marching its kindness, selflessness, or love. Our kindest deed just could be to tell others about it. Does James' statement in James Chapter 2 verse 18 that one can demonstrate his faith by his works contradict Paul’s statement in Romans 3:28 that a man is justified by faith without the deeds of the law? 3) The work that James said justifies Abraham was his offering up of Isaac (Genesis 22:9,12), an event that occurred many years after he first exercised faith and was declared righteous before the Lord (Genesis 12:1-7; 15:6). Instead Abraham’s offering of Isaac demonstrated the genuineness of his faith and the reality of his justification before God. James is emphasizing the vindication before others of a man’s claim to salvation. James teaching perfectly complement’s Paul’s writings; salvation is determined by faith alone (Ephesians 2:8-9) and demonstrated by faithfulness to obey God’s will alone (Ephesians 2:10).